Delhi, the capital of India, is one of the most loved and visited cities in the country. Thriving with tourists and travellers all year round, Delhi never fails to impress. Whether someone is here to explore the young and energetic party culture or the impressive history –people always leave Delhi with a bag full of memories. So, now that you have already got the Bangalore Delhi flights booking sorted, read down the list of monuments that will leave you impressed on your visit to the national capital. Elected as a UNESCO World Heritage Site and the official location for the annual flag hoisting ceremony (15th August – Independence Day), Red Fort is undoubtedly not to be missed if you are crazy about history. The fort served as the chief residence of the emperors of the Mughal dynasty and was also the political and ceremonial centre of the Mughal State. Chandni Chowk is the closest metro station on the yellow line to this fort. It will take roughly around 10 minutes to walk from the metro station to the Red Fort. Standing 73 metres tall, Qutub Minar is UNESCO World Heritage Site and a popular shooting location as well. This soaring high minaret was built in 1193 by Qutab-ud-din Aibak and was coined as the tallest minaret in the world. The Qutab complex is worth taking a stroll on a day when theweather is also by your side. Qutab Minar metro station on the yellow line is the closest station to this minaret. It takes 3 minutes’ drive to reach the Minar from the metro station. Standing tall in the heart of the city, India Gate honours the 70,000 Indian soldierswho lost their lives during World War I.It is engraved with names of more than 13,516 Indian and British soldiers who were killed in the Afghan war of 1919.Central Secretariat on the yellow line is the closest metro station to India Gate. It will take approximately 10-15 minutes’ walk to reach here from the metro station. 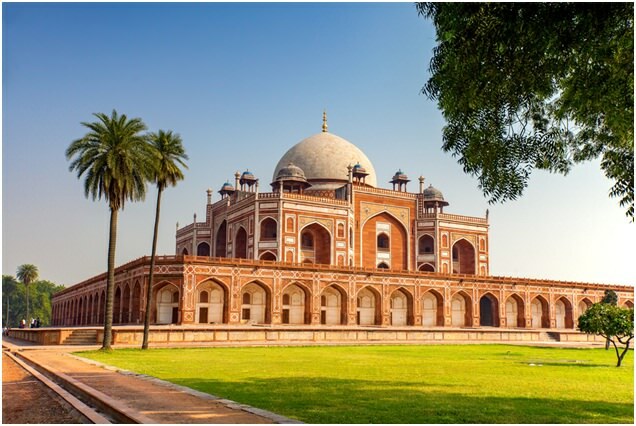 Located close to Lodhi Road, Humayun’s Tomb is a fine example of the Mughal Architecture. The tomb was commissioned by Humayun’s first wife Bega Begum and was a Persian architect. Don’t forget to take your camera to bring back hundreds of pictures of this classic tomb that dates back to1565 A.D.JLN Stadium on the purple line or Jor Bagh on the yellow line is the closest metro station to the Humayun’s Tomb. So, get all geared up to spend an evening on the gardens of the tomb with your family and friends. Not only for the history buffs, the Jama Masjid and the area around is also a mecca for the food lovers. Serving as one of the largest mosques in India, Jama Masjid has three great gates and was built by Shah Jahan in 1656 AD. This mosque restricts the entry of the tourists during the prayer hours and remains open from 7am to Noon and 1.30pm to 6.30pm.Chwari Bazar on the yellow line is the closest metro station to Jama Masjid. An easy 10 min walk is all it takes to reach this mosque from the metro station. Now that you know the top 5 historical monuments of Delhi, it’s time that you make the most of your Bangalore to Delhi flights booking by exploring all the nooks and corners of these locations. Also, don’t forget to savour the mouth-watering food offered around the area of Jama Masjid if you love treating your taste buds with authentic Indian and Mughlai food.